"Monk's beard more popular in gastronomy"
During the winter months or during the pre-Christmas season, the demand for vegetable specialties is increasing. Monk's beard, or Barba di Frate is becoming more and more popular in the winter season as well. As a good component for numerous dishes and currently available in large quantities, the Italian product is primarily in demand among (top) restaurateurs, says Valerio Petracca of the wholesaler with the same name, based in Pieterlen (Switzerland). The Swiss wholesale company buys its goods directly from the northern Italian region of Veneto, the main growing area for Monk's beard. It is, according to the young manager, a classic winter product: "We got the first arrivals 2-3 weeks ago. Normally, the campaign will run until February-March, subject to availability." 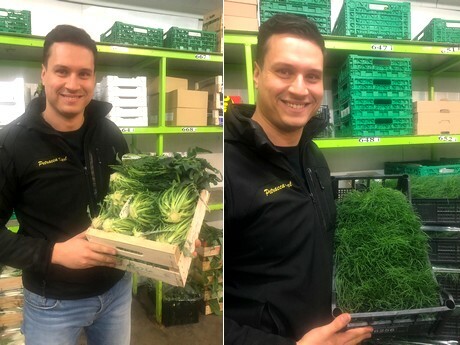 Valerio Petracca shows two Italian winter crops from his varied assortment: on the left the Broccolo Fiolaro di Creazzo and on the right Monk's beard. In terms of price, the prices of Monk's beard remain largely stable: "We started selling at a price of 7 to 8 euros per kilo. Currently, the price is between 4 and 5 euros per kilo." The major supplier also expects that sales in the coming weeks will go up significantly. "Around Christmas, we have up to 50 percent larger sales." According to Petracca, the interest in the unique product is growing. Demand is growing year by year. Although some Monk's beards also end up in the supermarkets, it is mainly upscale restaurateurs who include this particular product in their assortment. "That's why, since last year, we also supply packaged Barba di Fratte without roots in units of 4 x 300 grams each. This way, one can use the goods more practically and with less waste. Otherwise, we deliver the product as bundled goods, in 5-kilogram boxes." Monk's beard is by no means the only specialty that is currently arriving in the large warehouse of Petracca. Among the seasonal best sellers are Cima di Rappa and Catalogna as well. Another product that currently comes from the Veneto region is Fioglaro di Creazzo. In contrast to the above-mentioned vegetable varieties, this is an absolute rarity that has yet to establish itself within the Swiss trade: "We have been offering this variety for about 4-5 years now, and it is best compared to the broccoli we know, yet with thinner leaves. The season of this product runs, so to speak, in parallel with that of Monk's beard," says Petracca. 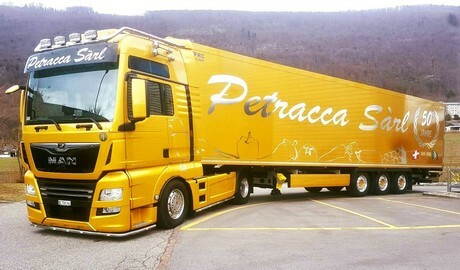 Petracca Sàrl specializes in the sale of exclusive fruit and vegetable specialties. This year, the family-owned company based in Pieterlen celebrated its 50th anniversary. ​​Currently, it has branches in Italy (Milan wholesale market) and Turkey, which makes it possible for the mixed clientele to receive high-quality products from any region as quickly as possible.